In a grand white-marble building at the site of the historic St. Louis Hotel, this recently renovated property makes for a graceful and stylish stay on one of the chicest blocks in the French Quarter. Need a trim? Travel one level below the lobby to find the hotel's old fashioned barber and full service beauty shop. 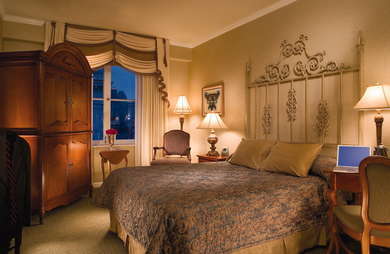 Standard “Petite” rooms are cozy but comfortable with queen beds and French and Creole decor. Select rooms have French doors that open out onto the hotel’s interior courtyard, while others have wrought iron balconies looking over St. Louis Street. YOU SHOULD KNOW Petite rooms are aptly named: at 175 square feet, they are quite smaller than the typical standard at a luxury hotel. Marble bathrooms have walk-in showers, with select jacuzzi suites. The multi-leveled lobby of marble, chandeliers, and grand pianos provides plenty of small seating areas with plush chairs and antique style decor. Enjoy spectacular views of the Mississippi River and French Quarter from the seventh floor pool deck, with a large seating area and bar. There's a full fitness center overlooking the pool deck. They have complimentary water and fruit. The elegant dining room at The Rib Room will have you feeling like French royalty. The cuisine offers traditional French and Creole specialties: charcuterie, turtle soup, pates, and fresh seafood dishes. Touché Bar offers light, casual fare like sandwiches and salads. The Rib Room has an elegant oak bar, where Touché Bar, overlooking Royal Street, is more casual than the rest of the hotel, with a pub-like atmosphere and open doors on all sides for excellent people watching. The corner of Royal Street and St. Louis is stylish, but popular and quite crowded with foot traffic. The hotel offers overnight valet parking, and within the Quarter on foot or by pedicab is the best way to travel. In a beautifully dilapidated historic building, Napoleon House (1-minute away) is an atmospheric setting for classic food and drinks. Down the street, Sylivain (3-minute walk) offers inventive American fare in an old carriage house with a stone courtyard. Kingfish (2-minute walk) is one of the neighborhood's staple classic cocktail establishments, and Chart Room (3-minute walk) is a divey people-watching spot with a great sazerac. It has the historic grandeur many crave from the French Quarter, but with none of the usual decay: just top notch modern accommodations and service.